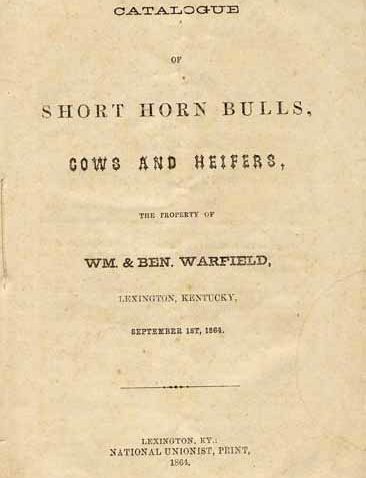 A recent and rare acquisition for the Department for Library Special Collections, with only 16 pages total, is a Catalog of Short Horn Bulls, Cows and Heifers (1864) that offers 12 bulls and 48 cows for sale by William & Benjamin Warfield of Lexington, KY. 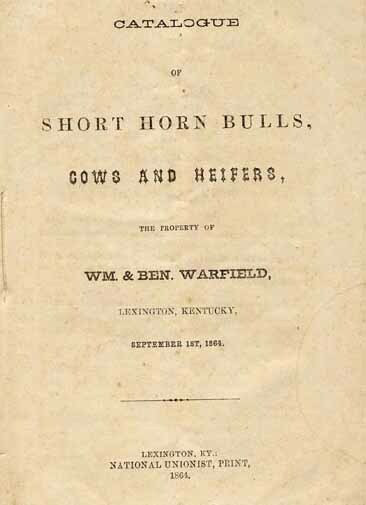 The Warfields, as observed in the Cyclopedia of American Agriculture must be included in any history of Shorthorns. They were prominent and quite well known during the years in which Kentucky supplied much of the Shorthorn blood to the breeding herds of this famous breed throughout the United States. William was the son of Benjamin Warfield and also a breeder of the shorthorn cattle in Kentucky. William Warfield was one of the best informed men on Shorthorn history and Shorthorn pedigrees. He contributed much to live stock and especially to Shorthorn literature, writing the “History of Improved Shorthorn Cattle” and “The Theory and Practice of Cattle Breeding.” The Warfield’s most active period was during the 1870s and 1880s, when the farmers of Kentucky, Ohio, and westward began extensively to improve their stock by the use of purebred cattle. Short-horn cattle were developed in England to serve as both dairy and beef animals and were brought to America in 1783. Exciting auctions of livestock were common in the 1800s and catalogues such as this one, were produced. This catalog offered details of the animals such as color, date calved and lineage for each with an example being: “Young Duke, the sire of a number of animals in this catalogue, was bred by R.A. Alexander, was by Duke of Airdrie (12730) out of imp. Rosabille, by Bridegroom (11203) &c.” The Kentucky Encyclopedia notes that many of the prize winning shorthorns of the era enjoyed as much prestige as some of the governors and perhaps contributed as much or more to the national recognition of the commonwealth! The Kentucky Library Research Collection is the only known repository of this catalog. To see other books and illustrative materials in Special Collections search our catalog, KenCat or WKU Library One Search.